What determines whether children grow up to be rich or poor? 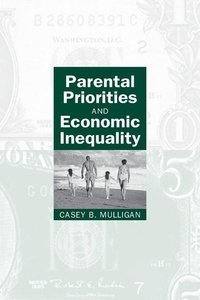 Arguing that parental actions are some of the most important sources of wealth inequality, Casey B. Mulligan investigates the transmission of economic status from one generation to the next by constructing an economic model of parental preferences. In Mulligan's model, parents determine the degree of their altruistic concern for their children and spend time with and resources on them accordingly-just as they might make choices about how they spend money. Mulligan tests his model against both old and new evidence on the intergenerational transmission of consumption, earnings, and wealth, including models that emphasize "financial constraints." One major prediction of Mulligan's model confirmed by the evidence is that children of wealthy parents typically spend more than they earn. Mulligan's innovative approach can also help explain other important behavior, such as charitable giving and "corporate loyalty," and will appeal to a wide range of quantitatively oriented social scientists and sociobiologists.